In 2001 Dean Kamen -- who did not play Superman, but thought he was one -- was touting his lastest invention to the press ... the Segway. He claimed that the Segway would "be to the car what the car was to the horse and buggy". Sales figures of 50,000 to 100,000 units were predicted in the first year alone. The world was going to be revolutionized. As of March 2009, only 50,000 Segways had been shipped ... less have been actually sold. Segway Inc. has been silent on its financial performance. The Segways were too expensive, too geeky and gimmicky, and in many countries their legal status was ill-defined ... if it was a motor vehicle it had to stay on the road, not on the footpath or cycle lanes. The Segway failed in all respects except one ... it has become a pervasive part of popular culture. Hardly anyone in the world has one, yet we all know what one is. If someone gave you a Segway I doubt you'd say; "No!" Like me, you happily parade it around the block, letting friends and neighbours have a go, then find a permanent home for it in the closet next to the exercycle and the Commodore 64. Many people dream of changing the world for the better. Dean Kamen may have failed with the Segway, but he'd already invented the AutoSyrine, an insulin pump, and an all-terrain electric wheelchair. 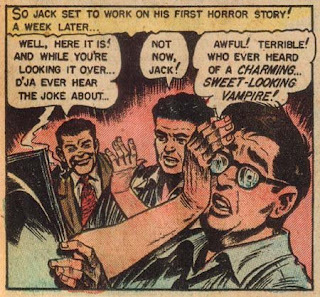 Dean's father, Jack Kamen, was a comic-book illustrator, who was particularly known for his work with EC Comics . His editor once said he "gave Kamen those stories where the All-American girl and guy are married, and then chop each other to pieces". EC Comics gave us the Crypt Keeper, Mad magazine, and more recently the homage to horror comics that was in Alan Moore's Watchmen, Tales from the Black Freighter, which has been made into a animated short-film. EC also gave us, accidentally, the restrictive censorship of the Comics Code Authority, thanks to the engineered public outcry against some of the EC stories. The Code included rules that seemed to be directly targeted against EC alone, such as "[n]o comic magazine shall use the word horror or terror in its title" and "[s]cenes dealing with, or instruments associated with walking dead, torture, vampires and vampirism, ghouls, cannibalism, and werewolfism are prohibited". Ironically, without the heavy censorship of the CCA we may never have had the underground comics explosion of the late sixties. Pushing against, and trying to go around, the Code actually produced some of the best work in comics. Oddly enough though, the Code rule that "[f]emales shall be drawn realistically without exaggeration of any physical qualities", never seemed to be enforced in superhero comics. So there you go, I managed to segue from a failed mode of transport to overly endowed women in comics. Why do I always seem to end up there?